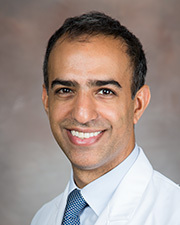 Yazan J. Alderazi, M.D. is fellowship trained in endovascular surgical neuroradiology, neurocritical care and vascular neurology. His practice encompasses the full spectrum of neurointerventional procedures in the brain, spine, head and neck; with a focus on brain aneurysms, arteriovenous malformations, carotid stenosis and stroke. Dr. Alderazi received his medical degree with honors from the Royal College of Surgeons in Ireland. Subsequently, he completed residency in neurology at the Barrow Neurological Institute where he also served as chief resident. He then completed fellowships in vascular neurology at University of Texas at Houston, neurocritical care at the University of Miami and endovascular surgical neuroradiology at Rutgers University. Prior to returning to Houston, Dr. Alderazi established and directed the neurointerventional surgery program at Texas Tech University-University Medical Center at Lubbock. This was the first center in the region to deliver organized neuroendovascular treatment of stroke, and became the busiest in West Texas for neurointerventional procedures. He also established the clinical neuroimaging service giving patients access to 3T MRI technology for the first time in the region. Dr. Alderazi returns to the University of Texas Health Science Center at Houston to expand the cerebrovascular and neuroendovascular services. He is currently an assistant professor of neurology at McGovern Medical School at The University of Texas Health Science Center at Houston (UTHealth).